What Happened To $1Billion Released For Security? Last week’s reported attack on the 157 Military Task Force Battalion in Metele, Borno State by Boko Haram terrorists shook Nigerians to their bones. The reason for the shock was because of both the high casualty figure (put at over 100) as well as the video of the attack circulated by Boko Haram, depicting the graphic killing of Nigerian soldiers. The news, which was broken by the online newspaper, Premium Times, was followed up with a video report attributed to soldiers who survived the attack. The video showed the military vehicles destroyed by the terrorists as well as the lamentation from the soldiers that they were poorly equipped, which made it possible for Boko Haram insurgents to overrun them so easily. But last week’s attack on the military was not the first of its kind in recent months. It was just that it was different in magnitude and pictorial reportage. In April this year, the AFP reported that Boko Haram fighters attacked a military base and two surrounding villages near the flashpoint Nigerian city of Maiduguri, killing at least 20 people and wounding 84. In September, the same AFP also reported that 48 people were killed when Boko Haram fighters in trucks stormed the army base in Zari village and briefly seized it after a fierce battle. 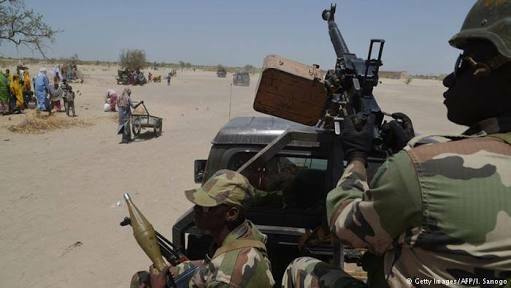 On November 15, the news medium also reported that at least three soldiers were killed by Boko Haram when the insurgents attacked a military base in Guzamala, Borno State but the Nigerian troops rallied to flush out the Boko Haram forces. There have been other attempts on the military in recent times. It shows that contrary to the claim by the administration of President Muhammadu Buhari that Boko Haram had been “technically defeated” and “downgraded”, making the group focus only on “soft targets”, the Boko Haram insurgents have been targeting military bases and wreaking havoc, to prove that they are still as potent as ever. The repeated complaints by soldiers of poor equipment and motivation and the effrontery of the Boko Haram to attack military bases and video the attack raise some questions. In addition to the security vote in the budget, what happened to the $1bn special fund approved for the purchase of security equipment? In April this year, the Minister of Defence, Mansur Dan-Ali, disclosed that President Muhammadu Buhari had approved the release of $1bn to Nigerian Defence authorities for the purchase of security equipment to fight insecurity in the country. One billion dollars is the equivalent of N360bn. Note that in December 2017, the Ekiti State House of Assembly passed a budget of N96bn for the state. In February this year, Governor Kashim Shettima of Borno State signed the N181.2bn budget of the state into law. In the same February of this year, the Anambra State House of Assembly passed the 2018 appropriation bill into law: N170.9bn. This shows that the special fund of N360bn for security is equal to the combined annual budgets of two states. This amount excludes the statutory allocation to security in the 2018 budget. According to the online government watchdog, BudgIT, “In the proposed 2018 Budget, N1.323tn is allocated to security, up from 2017 figures of N1.142tn.” Note that even though the Presidency proposed a total budget of N8.6tn for the 2018 fiscal year, the National Assembly eventually passed a budget to N9.1tn. It is sad that the soldiers should be complaining of not being properly funded. It was reported that the attack at Metele lasted for about 45 minutes. That was long enough for the military to send aerial support to Metele to dislodge the Boko Haram terrorists. Why did the soldiers not get that crucial back-up from the air, to save lives and save Nigeria’s integrity? Was there no SoS from Metele? Were there no fighter jets to promptly respond to the distress call? There were also reports that after sacking the military base, Boko Haram’s insurgents even stayed back to ensure that corpses of the slain soldiers were not taken by the military. Those who attempted to retrieve the corpses were attacked. It was only on Monday (yesterday) (one week after the attack), that it was reported that the Nigerian Air Force planes bombed the hideouts of Boko Haram in Metele to dislodge them. It was also a failure of intelligence that Boko Haram would plan such a massive attack and execute it without the military authorities having wind of it, so as to foil it. Since the war against Boko Haram started, there have been accusations that there are moles in the military working for Boko Haram against the soldiers and the nation. This is also what intelligence should find out and stop. Interestingly, last week too, while Boko Haram was killing Nigerian soldiers, the Federal Government was releasing about 156 former Boko Haram members into the society. The media reported that the 156 men, who were said to have repented and surrendered, on Wednesday swore allegiance to the Nigerian government after undergoing a De-radicalisation, Rehabilitation and Reintegration programme, named Operation Safe Corridor. The repentant insurgents took the oath of allegiance before Justice Nehizena Idemudia Afolabi of the Federal High Court, Gombe at the DDR rehabilitation camp in Gombe. The former Boko Haram members dropped their weapons and surrendered to the Nigerian Army. Consequently, they were enlisted into the 11-month de-radicalisation programme, where they received vocational skills training by different government agencies. 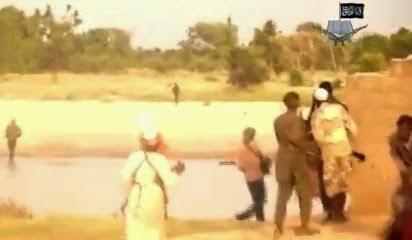 While the video of last week’s attack by Boko Haram is demoralising to every Nigerian who watched it, it is a superb ego-thumping propaganda tool for the Boko Haram for the purposes of recruiting more members, striking fear into the hearts of many not to trust the military to protect them, convincing people to see education as evil, and getting more funds from its sponsors and sympathisers. The Nigerian military should not have allowed Boko Haram to record such a success against it. Those slain soldiers are people’s children, husbands, brothers, fathers, friends, colleagues, etc. Nobody wants to lose a loved one in such a manner. While Nigerians are angry over the way those soldiers were killed, their families must be devastated. Those who don’t know if their family members were affected would be extremely anxious. Soldiers who lost their colleagues in such a manner would be demoralised to fight. It is true that once soldiers get enlisted, they have signed to fight in defence of their nation, but nobody wants to die in an avoidable circumstance. It should also make Nigerian soldiers to place premium on the lives of Nigerian civilians. When Nigerian soldiers shoot at civilians during a disagreement or a protest, they should know that life is precious and should not be wasted because one has a gun. When a life is cut short with bullets over issues that require batons, water cannon, blank bullets, pepper spray, etc, it is devastating to the bereaved. Finally, there is also failure of leadership from Buhari as the President of Nigeria and Commander-in-Chief of the Armed Forces. It is said that a winning team should not be changed, but nobody ever said that a losing team or a fumbling team should not be changed. Since Buhari came into office in 2005, he has never reshuffled his cabinet, neither has he ever reshuffled his security chiefs. No matter the mediocre performance of an aide, Buhari keeps the person. The only few people he has ever removed were people like Babachir Lawal (former Secretary to the Government of the Federation), Ayo Oke (former Director-General of National Intelligence Agency), and Lawal Daura (former Director-General of Department of State Services) who had big scandals against them. And for that to happen, it took a long time and a national outcry. Even when the tenure of the military chiefs expired, he renewed it, without any proof that they had brought any difference to the security of the nation. What has happened is that those who work under Buhari feel presumptuous and nonchalant because they know that their positions are guaranteed, no matter their performance. Why is the President still keeping the fumbling security chiefs on their seats till now?